A luxuriously crafted Tolkowsky 1/2ct I I1 brilliant round diamond framed with a halo of diamonds and sparkling diamond encrusted shoulders, set on a beautiful 18ct white gold ring. As the inventors of the Ideal Cut, Tolkowsky adheres to the highest standards of quality with diamond centre stones that achieve the best combination of fire, brilliance and sparkle within the diamond. Tolkowsky 18ct white gold 1/2ct I-I1 diamond halo ring is rated 5.0 out of 5 by 3. 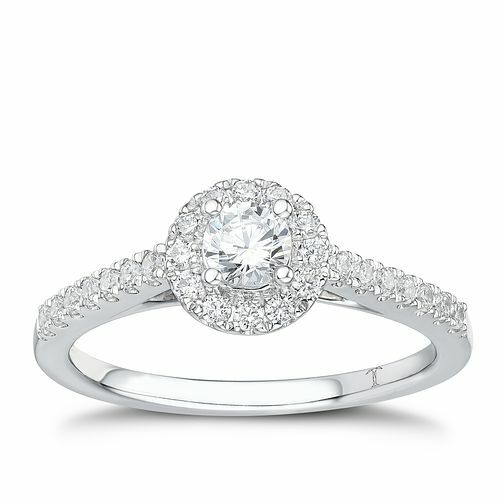 Rated 5 out of 5 by Anonymous from Stunning sparkle Is an absolute gorgeous ring, I brought this for my partner for her engagement ring. Not yet popped the question as waiting to go on holiday however felt the need to mention how nice the ring is. I went every where to find the right ring, I was unsure about the brand of ring to start with but from seeing so many rings this really is a stunning ring and you can tell why that brand has the values it does when they craft diamonds it’s very sparkly bright! also the advice, help and care I got from the girls in earnest jones Norwich was great made me feel very comfortable. Rated 5 out of 5 by Anonymous from Beautiful delicate ring An absolutely beautiful ring with the perfect amount of sparkle. The dainty band makes it look very elegant as well!